The University of New Brunswick held the official ribbon cutting event for the new Kinesiology Building at UNB Fredericton this morning. This 60,000-sq. 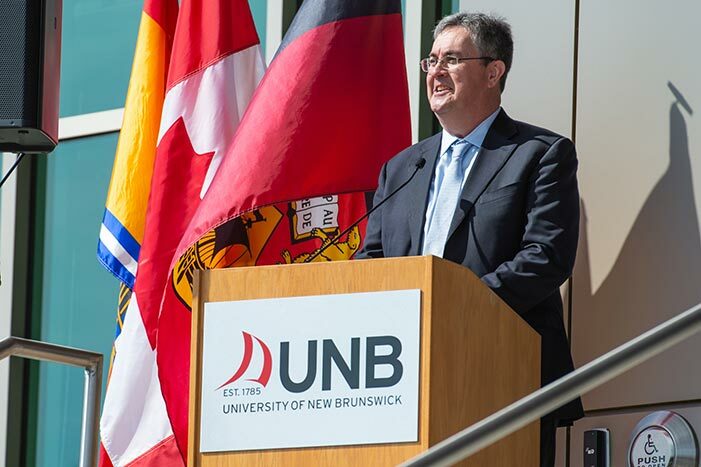 ft., $36-million building will create a nationally significant research cluster focused on health, wellness, physical fitness and health promotion that will establish New Brunswick as a leader in preventative health care. The growing cost of treating chronic illnesses is driving the demand for more applied research in preventative and rehabilitative care. Along with advancements in research and education the new building will bring, it also has a number of unique features. Trees from the project site were harvested into a seating area, teaching podium, reception desk and locker room benches for use inside the building. Chairs from the seating area of “The Pit” in the Lady Beaverbrook Gym have been refurbished and given a place of prominence. A living wall and a vegetative roof bring life to the indoors and outdoors, and recycled rain water is used throughout the building. A 50-year time capsule was placed in the building’s cornerstone, containing dozens of items such as a handcrafted pencil from a former kinesiology dean, a Fitbit, the UCard of UNB’s 2017 Student Union president, and a 3D printed whistle created by an engineering student. The project was made possible thanks to a $24.87-million investment from the Government of Canada and the Province of New Brunswick. Today’s event was attended by MP DeCourcey, Minister Horsman and Dr. Campbell, as well as Dr. George MacLean, vice-president academic (Fredericton); Dr. Wayne Albert, dean of kinesiology; Imelda Perley, UNB’s elder-in-residence; and Mikaela Dodig, a third-year kinesiology student and Reds women’s basketball player. Group photo: L-R: Dr. George MacLean, UNB vice-president academic (Fredericton), Fredericton MP Matt DeCourcey, UNB Elder-in-Residence Imelda Perley, Deputy Premier Stephen Horsman, UNB kinesiology student Mikaela Dodig, Dr. Wayne Albert, UNB dean of kinesiology, and Dr. Eddy Campbell, UNB president and vice-president.